People with hypertension, particularly in disadvantaged communities in places like rural Bangladesh are more likely to have uncontrolled blood pressure (BP), indicates a new multi-country study with icddr,b. It is widely known that high BP or hypertension is a major risk factor for cardiovascular diseases (CVD) such as stroke and heart diseases. Uncontrolled BP is a leading cause of death and disability in South Asia. Recent findings from the trial called COBRA-BPS (Control of Blood Pressure and Risk Attenuation – Bangladesh, Pakistan and Sri Lanka), published in the American Journal of Hypertension seeks to understand what might determine such risks among individuals aged above 40 years in rural South Asia. Although hypertension is often dubbed a ‘rich man’s disease,’ those with uncontrolled BP were more likely to belong to ‘lower wealth index,’ indicates the recent study. The research deploys government community health workers (CHW) to educate individuals about BP control at home by a adopting healthy lifestyle (reducing salt and saturated fats in diet, increasing fruit and vegetable intake, weight management, increasing physical activity, smoking cessation, and adherence to antihypertensive medications), and referal to physicians trained in updated management of hypertension,and establishing referral tracking systems with standardised documentation and follow-ups. “Our recent publication from COBRA -BPS study generates strong evidence that people in rural Bangladesh are at higher risk of having a stroke (21.5%) than our neighbouring countries (10-11% in Pakistan and Sri Lanka), individuals with hypertension also suffer from diabetes (24.5%), and heart diseases (18.4%)," observes icddr,b associate scientist Dr Aliya Naheed, the country lead of COBRA-BPS trial in Bangladesh, and head of non-communicable diseases (NCDs) initiative at icddr,b. The COBRA-BPS intervention strategy is a simple pathway for integrating essential services for hypertension in health systems by empowering the government health work force in rural areas. "It is expected to develop a low-cost public health strategy for preventing premature deaths in Bangladesh as well as other low and middle income countries,” adds Dr Naheed. Earlier, findings from a feasibility study on the COBRA BPS trial published in the Journal of Hypertension found this multi-pronged strategy highly successful. Individuals in Bangladesh experienced the greatest reduction in blood pressure while their physical activities improved and the use of anti-hypertensive medications increased significantly in comparison to the two other countries. The feasibility study findings recommended scaling up the strategy to curb CVDs in low-resource settings. Dr Tazeen H Jafar, the overall principal investigator of the study and professor of health services & systems research programme at Duke NUS Medical School, Singapore observes that health systems in many South Asian countries are not geared to detecting and treating hypertension. Commenting on the links between ‘lower-wealth index’ and uncontrolled BP, Prof Jafar observes that the disadvantaged communities may not have adequate knowledge about healthy lifestyles and diet required to keep high blood pressure and CVD in check. “The COBRA-BPS trial is evaluating multifaceted strategies that strengthen the existing health systems with excellent outreach to all including the poorest of the poor in rural communities in South Asia,” she adds. The trial is supported by Joint Global Heath Trials Scheme of the UK Department for International Development, the Medical Research Council, and the Wellcome Trust. The rise of NCDs in LMICs: How to tame this? The World Health Organization (WHO) mentions CVDs as the major cause of NCD deaths, claiming 17.7 million lives annually. Many individuals aged between 30 and 69 are experiencing ‘premature’ deaths from NCDs, with an estimated 80 percent of these occurring in low and middle-income countries (LMICs). Data from Matlab – icddr,b’s demographic surveillance site in Bangladesh has earlier found that rural household with an NCD death are more at risk of poverty – mostly resulting from economic impacts such as loss of employment of the head of households. Therefore the repercussions of these deaths are not limited to public health. “We expect that the COBRA BPS study strategies will be one of the most appropriate interventions to tackle the rising burden using the existing healthcare infrastructure,” comments Dr Naheed. 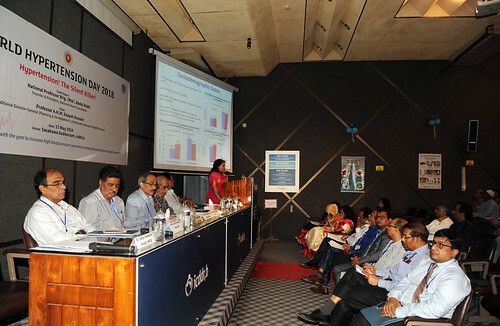 Based on the COBRA BPS feasibility study recommendations, the researchers crafted their interventions by involving home health education by the CHWs, BP monitoring and stepped-up referral to a trained general practitioner, providing hypertension management training, designating hypertension care coordinators etc. for over 2,500 individuals with hypertension. Moreover, low income individuals with poorly controlled hypertension would be provided with compensation and subsidies for additional health services, reports preliminary findings published in European Heart Journal. At the next stage, the researchers are planning to assess whether these strategies are effective and cost-effective than regular healthcare for hypertension in the three South Asian countries, according to a study protocol published in Trials.